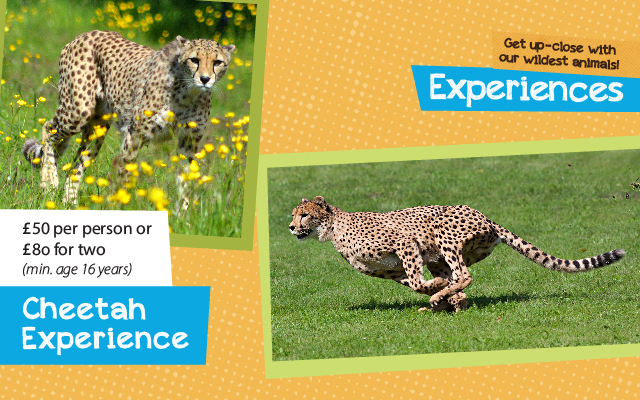 In this thrilling experience, get unrivalled behind the scenes access to the impressive cheetah enclosure, where you will get up-close and personal to the world’s fastest land animal. The unforgettable chance to feed and watch the cheetahs hunt their food from only inches away! The opportunity to learn about the species and ask our knowledgeable keepers all about our coalition of cheetahs. By buying a Cheetah Experience, not only will it be a day to remember but you will also be contributing to our conservation work both here and around the world, helping to save animals from extinction. Availability for the Cheetah Experience is limited so we recommend booking early. The experience is available for adults over the age of 16 years old. Please note that the spectating guest will not go behind the scenes; however there will be the opportunity for them to take fantastic photos of the participant whilst visiting our cheetahs.